Home > AMT Blog > “Ricky Nelson Remembered” Comes to AMT October 13! “Ricky Nelson Remembered” Comes to AMT October 13! Ricky Nelson was an actor, musician, and singer/songwriter. Although he began in radio and television, it was his music career that launched him into the spotlight. He is considered one of the top “teen idols” of the 1950s. His fame only continued to expand from there. Ricky Nelson Remembered is a unique multi-media entertainment event honoring this legend. 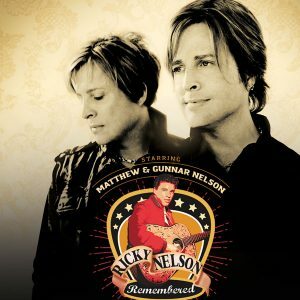 His twin sons, Matthew and Gunnar, perform several of Ricky Nelson’s hit songs, including “Travelin’ Man” and “Garden Party”. You’ll experience never-before-seen video footage from the Nelson family including interviews from celebrities influenced by Ricky Nelson. Come on out Friday, October 13 at 7:30 p.m. and celebrate the life of America’s original “Teen Idol”! Reserve your tickets today by calling 800-648-4102 or by booking online. Eric Hilliard Nelson was born on May 8, 1940 in Teaneck, New Jersey. The second son of entertainment couple Harriet Hilliard Nelson and Ozzie Nelson, performing came naturally to Ricky. Towards the end of 1941, the Nelson family settled in what would become their permanent Los Angeles home. The Adventures of Ozzie and Harriet first debuted as a radio show in 1944. After several years being played by professional child actors, Ricky, and his older brother David, joined the show. In 1952, the family released the film Here Come the Nelsons as a test. The film was a hit, and so The Adventures of Ozzie and Harriet made its television debut in October of 1952. The show ran until September of 1966, making it one of the longest-running sitcoms in TV history. When Ricky was 16, his father helped secure a one-record deal with Verve Records. He recorded a few songs in March of 1957. Before the single “A Teenager’s Romance” was released in April of 1957, Ricky debuted on an Ozzie and Harriet episode, singing and playing the drums to the Fats Domino standard “I’m Walkin’”. His songs charted in the top five on Billboard’s Best Sellers in Stores chart and he later signed a lucrative five-year deal with Imperial Records. From there, he continued to gain fame. He was also the first teen idol to use television to promote hit records. Between 1957 and 1973, Nelson placed 53 songs on the Billboard Hot 100. His song “Poor Little Fool” was the first song to hit #1 on the then-newly created chart. Nelson recorded 19 more Top 10 hits before his untimely death in 1985. In 1987, he was inducted into the Rock and Roll Hall of Fame. TV Guide ranked him #49 on their 50 Greatest TV Stars of All Time list in 1996. There is no doubt Ricky Nelson is a legend. Experience the memories and celebrate an incredible artist at Ricky Nelson Remembered on October 13. Contact us to reserve your tickets today!